My second baby, otherwise known as Missy Moo, started school today - sorry, BIG school as its been referred to EVERY SINGLE DAY FOR 6 MTHS PLUS!!! She has been SO excited and literally counting down the days. I bought her a calendar so she could count down the days. Literally. Over the last couple of months we've been getting things ready, we bought uniforms, we bought the school bag and hat, we bought glue sticks in bulk as experience tells me we use ALOT of those babies. We've bought hair clips and ties in school colours, we've bought drink bottles and lunch boxes and practiced opening and closing them and packets and zip lock bags and well, you get the picture. The excitement has been epic. Epic I tell you. Her first day she was scheduled to start at 11.10. She was up and dressed at 6.30 and asked approximately every 2 mins from then on, 'is it 11 o'clock yet?' Excitement was epic. She only wobbled for a moment though, a cuddle seemed to fix it and she was good to go again, holding firmly onto Daddy's hand the whole way in. We went through the formalities and soon enough we were at the classroom, meeting her teacher (who is lovely) and saying goodbye. Daddy's hand was released and Missy Moo went straight into the classroom, exploring and touching everything - she said a quick goodbye and off she went. We were officially no longer required. We both went to pick her up and she proudly walked down to the playground, beaming and clutching her drawing of the day. BIG school is a huge hit and she can't wait to come back tomorrow. Her teacher told us she was quiet to start with but came out of her shell as the day went on, and even showed them some of her dancing. Yep, she's gonna rule that place before we know it. Watch out world, Missy Moo is loose and coming at ya, full speed! I couldn't be prouder of how she handled it and have no doubt she will love school. Today was a big day, today Monkey Man started BIG school! He's 5 and a half, more than ready and oh so excited to be a BIG school kid. 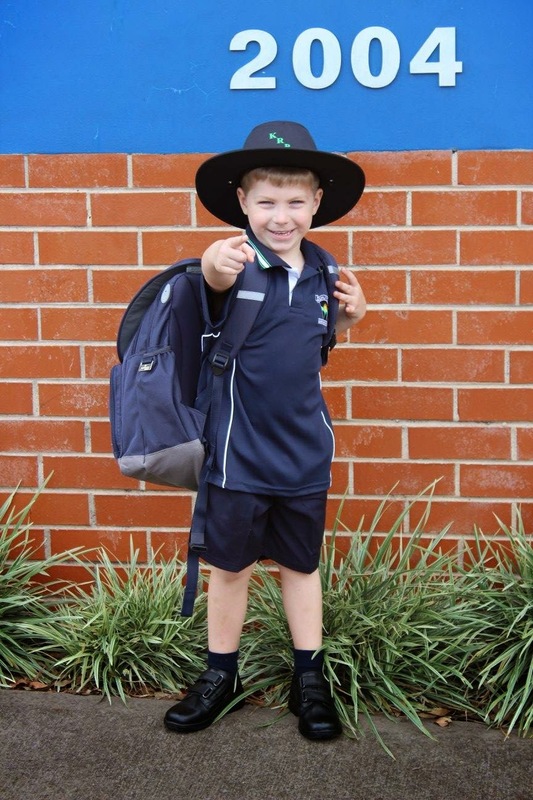 Being a July baby, he could have gone to school last year, as per the rules here in NSW.... however he wasn't ready and we made the decision to hold him back. I've had moments of wondering if we were doing the right thing. It's a controversial subject and many people have alot to say on the subject. Lots of those people have made me question my decision, our decision, but then Monkey Man would throw a tantrum because one of his sisters looked at him, or crunched their biscuit too loudly, or he couldn't get enough weetbix on his spoon.... and in those moments I knew he wasn't ready for school. Don't get me wrong, we still cop lots of 5 year old tantrums but he's alot more socially aware and we feel, ready this year. Are they ever really ready though? 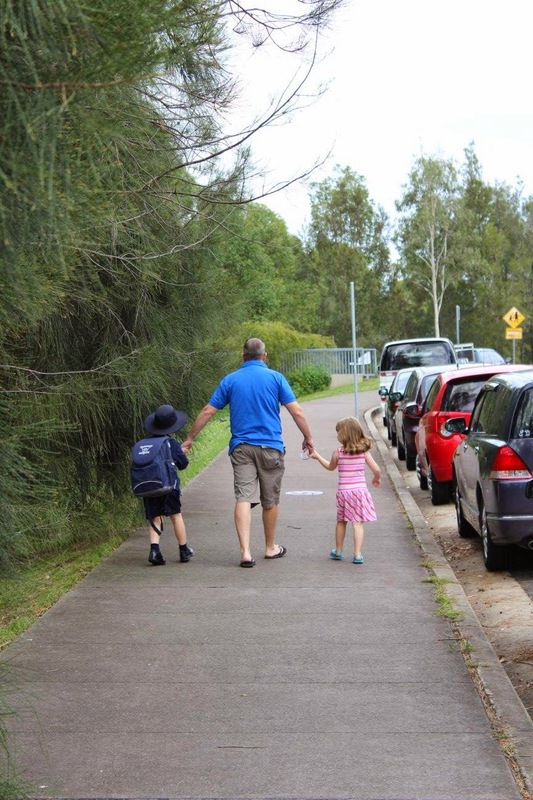 I watched him walk down the path towards school with his Dad and I felt my eyes get sweaty. He was clearly so excited, jumping around and grabbing at sticks and trees but still just a little boy. Would he make friends? Would he remember to not eat all his lunch at once? Would he listen to his teacher? Will he learn all he's supposed to learn? sigh. Who knows right? All I know is that it's time. Time for him to be a big kid and time to leave the nest. I've been seeing friends pictures of their kids starting school and getting all emotional. I was sure I would cry today but I was ok. My husband cried though but don't tell anyone!! I'm sure I won't cry until the first time I have to drop him at school and just leave him to fend for himself. Or maybe the first time he has a meltdown at me, or on the way, or the way home, or in the play ground? I'm sure I will cry eventually. I kind of hope I will? I bawl over other kids starting school. I was teary seeing another little boy cry today. I cry over TV births or deaths, or sad stories like abuse but when my own kids were born I didn't cry? What is that about? I'm clearly a weirdo. Anyway, apart from needing a quick cuddle, my little man wasn't phased at all. He said a quick goodbye and toddled off into his classroom. Proud is an under statement! I was bursting with the stuff! My girls wanted to know when they could go to school and why they couldn't stay. I suspect I will have to explain that a few more times, haha! He had a great day apparently, greeted me with 'I'm hungry!' and after saying bye to a couple of friends, old and new, we headed home. He then sat on the lounge, curled up in a ball and there he stayed for the afternoon. The child that never sits still, actually sat still and for a long time too. He was shattered, poor kid. Hubby carried him to bed which hasn't happened for a while. He was so overtired he threw a little tanty and then passed out cold - he's snoring his head off and hopefully having sweet dreams about tomorrow. Anticipation of what lies ahead. The 5 year old imagination is a magical thing . . something I truly wish I still had. 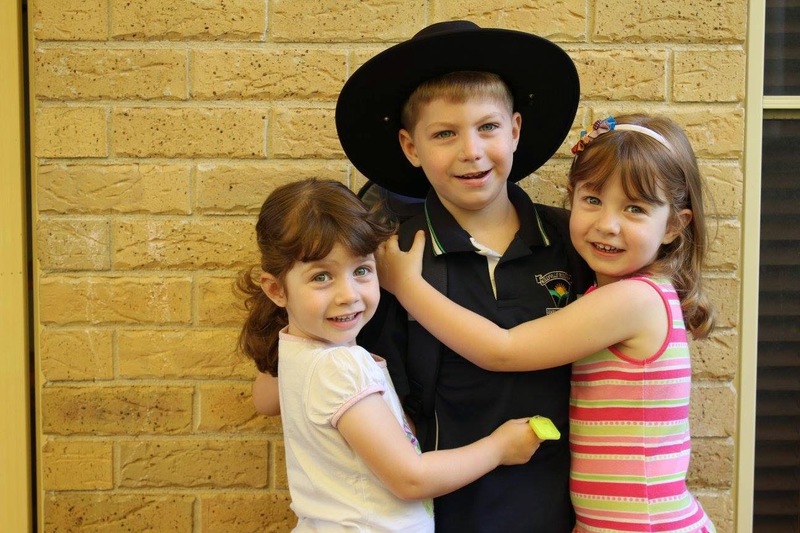 Mumma to 3 under 3 no more - now 4, 5 & 6 Life is crazy already, in fact you could say it was downright hectic. I love my kids, love watching them grow and learn but I love 7pm bedtime too! !